After I discovered the wonderful app Copy Me That, for meal planning, recipe keeping and organising which I blogged about recently over here, I have already planned our meal for these 2 weeks. One of the recipe I wanted to try is the Garlic & Lemon Chicken with green beans and red potato found in Food.com and I made it last Sunday. The original recipe is for chicken breast meat but we are not really a fan of breast meat, I rampaged our freezer and found 2 chicken thigh and decided to use them instead. Red potato? What is that? Never mind that, I have russet potato, they will do too. As you can see in the photo below, my one and only baking pan is HUGE, my corning ware pot is too small for the 2 chicken thigh and greens. 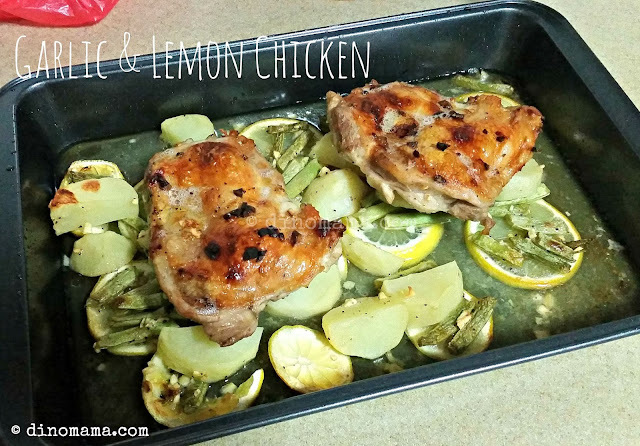 No choice, I have to use the baking pan but that did not compromise the taste of the chicken thigh though I think if I use a smaller baking dish with all the ingredients snugly tucked into and against each other, the taste will be even better. My green beans are grilled dry *opps* and some of russet potato were not fully cooked *double opps* , a friend suggested that I boil the potato first before putting them into the dish for baking. Good idea! Note to self - get a smaller baking pan/dish. 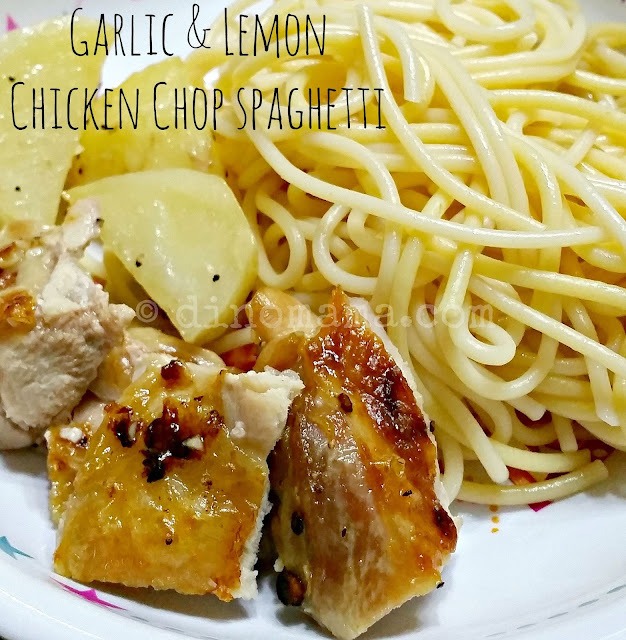 Anyway, since the chicken chop are seasoned with garlic & lemon, I thought I should just make a simple spaghetti tossed with olive oil to go with it. It would have been a perfect dinner if the side dish were ok but nonetheless it was still a great dinner. The next time I make this dish I am going to add MORE greens such as broccoli and carrot, I will probably use new potato too and of course to use a smaller baking pan. If you would like to try this recipe and using chicken thigh too, I grilled it for 40mins instead of 50mins as stated in the recipe because thigh meat are tender than breast meat thus needs shorter cooking time. And if you want to do it in your air fryer, I think you can do it at 200 deg for about 20mins, open up to check on the chicken thigh and air fry it for another 10mins or so. I am basing the cooking time on the Philips Air Fryer that I have, I have not done this in the air fryer before and using my experience with my air fryer to give a guage, you may have to adjust the cooking time. In any case, pull out the basket to check on the chicken and see if you need to cook it longer or not. Till the next recipe sharing post, have fun cooking! 2. Coat a large baking dish or cast-iron skillet with 1 tablespoon of the olive oil. 3. Arrange the lemon slices in a single layer in the bottom of the dish or skillet. 4. In a large bowl, combine the remaining oil, lemon juice, garlic, salt, and pepper; add the green beans and toss to coat. 5. Using a slotted spoon or tongs, remove the green beans and arrange them on top of the lemon slices. 6. Add the potatoes to the same olive-oil mixture and toss to coat. 7. Using a slotted spoon or tongs, arrange the potatoes along the inside edge of the dish or skillet on top of the green beans. 8. Place the chicken in the same bowl with the olive-oil mixture and coat thoroughly. 9. Place the chicken, skin-side up, in the dish or skillet. Pour any of the remaining olive-oil mixture over the chicken. 10. Roast for 50 minutes. Remove the chicken from the dish or skillet. 11. Place the beans and potatoes back in oven for 10 minutes more or until the potatoes are tender. 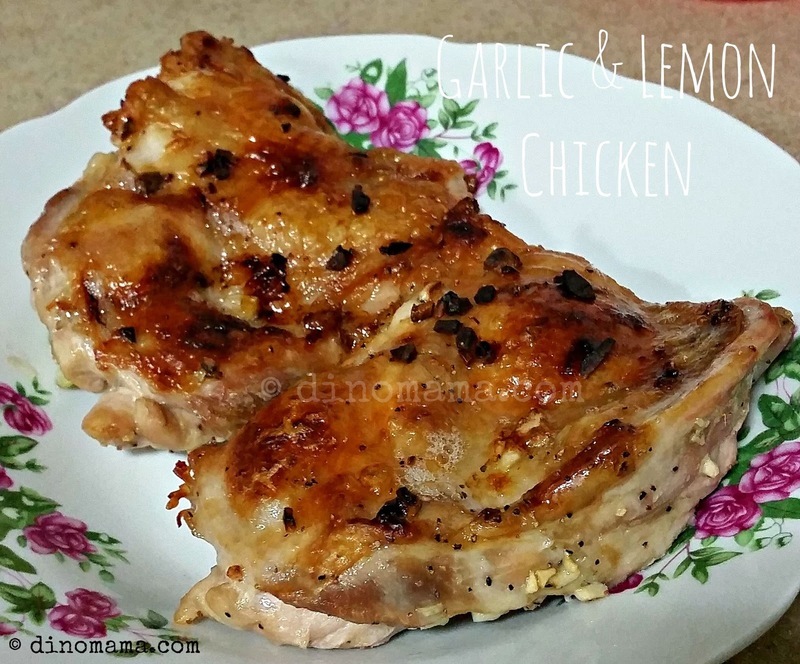 70 mins for Garlic and Lemon Chicken Chop. Oh, pretty long time. Hi Kathy, thanks for dropping by! I am always looking for simple, easy and quick fix dishes as I don't have much time to cook dinner after I reached home from work on weekdays. You'll love this recipe, I guarantee you!